Takil palm. French: Palmier du Kumaon, Palmier du Mont Thakil, Palmier du Mont Thalkedar. German: Kumaon-Hanfpalme. A solitary, medium sized, moderately fast growing, dioecious palm. Not known in cultivation, scarce in the wild. It has a hairy, brown trunk, 12.2 m. (40 ft.) tall, 17.8 cm. (7 inch) diameter with persistent leaf-bases and no obvious leaf scars, and large partially segmented, palmate (fan) leaves, 1.2 m. (4 ft.) long, 1.2 m. (4 ft.) wide, green above and, greyish green beneath. Trachycarpus takil can tolerate freezing temperatures to about -15°C (5°F) or even a little colder under certain circumstances. However, this is not a norm., and ideally you should not try to subject this palm to these temperatures. This is a montane species, and can grow in open sunny positions or as an understory palm growing under a tree canopy. The understory position will protect the palm from cold much better and prevent overly wind-damaged leaves, but we advise a south-facing position where the palm can catch as much of the winter sunshine as is possible. Abundant plants of this palm were noticed on Mount Takil, Kumaon by Duthie in 1886. 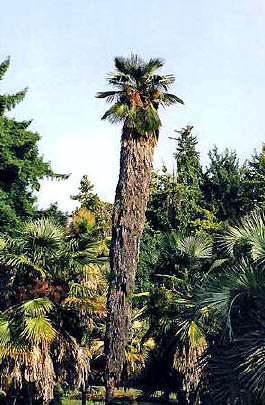 Beccari later named it as T. takil and introduced it in Europe in 1887, apparently from the seed collection received from plants of Chaubattia Botanical Garden near Ranikhet, Almora district, where the plants of this palm were raised through seed collection from wild population found in Badkot forests, Almora district. The palm is distinguished by a network of leaf sheath fibres that practically cover the trunk up to its base and by a whorl of old, persistent, reflexed leaves below the crown of fresh ones. Presently, the Takil mountain, a type locality of this palm, is untraceable. Most of the Badkot forest population has succumbed to forest fire leaving a few palms in Bunj Oak forest. The palm, however, has thrived well and has almost naturalised in Choubattia Botanical Garden, Raniket. Seedlings raised in Mumbai have survived well. Dioecious. Occurring in several, fragmented locations at 2000-2500 m. elevation in the Indian Himalayas. 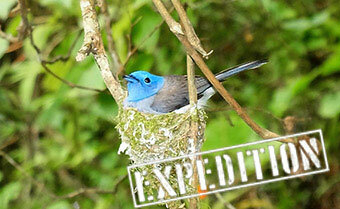 Possibly also in western Nepal.